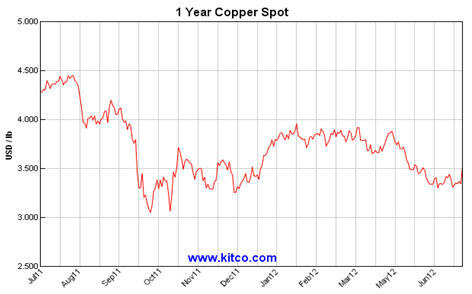 I recently opined on the long-term bullish fundamentals of the copper market (Mercenary Musing, May 28, 2011). Despite a promise to follow up immediately with a short-term commentary, a 24-day sojourn back and forth across North America forced a delay. However, I had time to decipher equivocal market signals and recent supply and demand trends. Four weeks after the fact, I present my views on the short-term fundamentals of Dr. Copper. 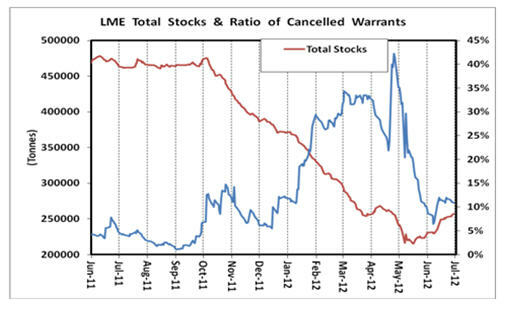 Low surplus inventories are also shown by a two and a half-year low in Comex stocks and a 40% reduction in Shanghai warehouses since a nine and a half year-high was reached on March 15. The three official global stockpiles of surplus copper now total 446,000 tonnes, equivalent to less than eight days of world consumption. Copper has been trading in backwardation or nearly so on both the one month and three month futures contracts for the past several weeks. This scenario is generally indicative of immediate tight supply and is a bullish signal for the short-term price. Recent strong backwardation at the front end of the LME curve continues to discourage shorts and could generate near-term short covering. Alternatively, the current backwardation could be viewed as market bearishness on near-term future demand as European economic worries and China’s economic growth slows and turns from infrastructure build-out to domestic consumerism. 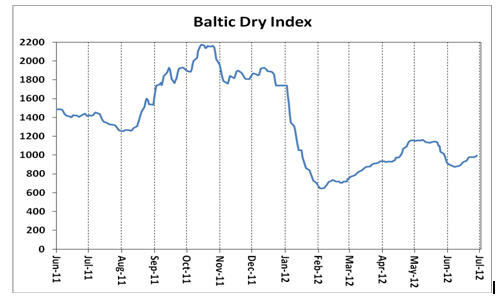 The Baltic Dry Index (BDI) measures current rates to ship bulk dry materials and is a key metric for intercontinental economic activity and demand for industrial commodities. The one-year chart shows high shipping rates during the last half of 2011 and a precipitous drop at the beginning of 2012 as demand slowed prior to the Chinese New Year. Rates have since rebounded but remain low and relatively stable. I view the indicator as neutral to bearish at this time. Supporting the bullish case, Chinese policy makers have indicated they will stimulate the economy again thru monetary policy and credit incentives, which should bolster GDP growth and lead to a soft landing. According to recent statistics from China Nonferrous Metals Industry Association, copper concentrate and refinery output are up significantly year over year at almost 9% and over 14% respectively. In addition, we are now in construction season in the Northern Hemisphere when copper demand typically is strong. The wild card in the copper market is China. Western World analysts do not have a transparent view of copper except for Shanghai Exchange warehouse inventories and government data on monthly imports, concentrates, and refinery output. In addition to unknown stockpiles held by the State Reserve Bureau, independent speculators, including the proverbial pig farmers, commonly hoard and dispose of significant copper stocks outside of official government channels. These shadowy movements of physical copper are subject to rumor and innuendo. Because of this, short-term data and informed opinions on the copper market can be compromised by the opaque goings-on in China. A potential game-changing development in the copper futures market has loomed for nearly two years. JP Morgan filed a prospectus to list a physical copper ETF on the New York Stock Exchange in early June. 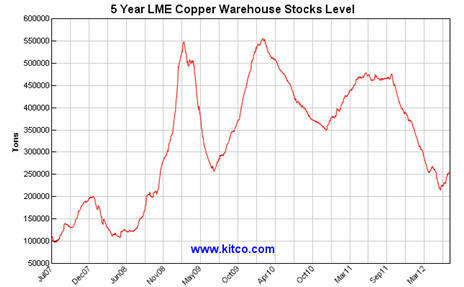 There are widespread industry concerns that removing a significant amount of LME warehouse inventories from world trading markets could drastically inflate copper prices, exacerbating already tight supplies, and causing global turmoil for this vital economic commodity. Recently a major US copper consumer and a hedge fund trader filed objections to the proposed listing with the SEC. It now appears the proposed copper ETF will be put on hold, at least for the short-term. It is my opinion that regardless of Europe’s never-ending debt problems and the United States’ slow GDP growth, the copper market appears tight to balanced for the short-term. Therefore, I expect its price to be range-bound near current levels. If it happens to re-test or drop below the spiky $3.05 bottoms in the fall of 2011, high-cost production will come off, Chinese speculators are likely to buy en masse, and I would expect a rapid rebound. The data and charts reflect China’s 36% of world consumption and its dominance of global copper markets. It is apparent to me that as goes China, so goes Dr. Copper. If its economy does indeed take an immediate hard landing predicted by some analysts, you can just kick my platform out the door. However, I prefer to take the contrarian view that this scenario is not going to happen anytime soon. To learn more of my views on the global copper market, please watch this recent clip from BNN’s Commodities with Andy Bell: Copper Outlook. Acknowledgement: Erin Ostrom is the editor of MercenaryGeologist.com. The Mercenary Geologist Michael S. “Mickey” Fulp is a Certified Professional Geologist with a B.Sc. Earth Sciences with honor from the University of Tulsa, and M.Sc. Geology from the University of New Mexico. Mickey has 35 years experience as an exploration geologist and analyst searching for economic deposits of base and precious metals, industrial minerals, uranium, coal, oil and gas, and water in North and South America, Europe, and Asia. Mickey worked for junior explorers, major mining companies, private companies, and investors as a consulting economic geologist for the past 20 years, specializing in geological mapping, property evaluation, and business development. In addition to Mickey’s professional credentials and experience, he is high-altitude proficient, and is bilingual in English and Spanish. From 2003 to 2006, he made four outcrop ore discoveries in Peru, Nevada, Chile, and British Columbia. Mickey is well-known and highly respected throughout the mining and exploration community due to his ongoing work as an analyst, writer, and speaker. Copyright © 2012 MercenaryGeologist.com. LLC All Rights Reserved.